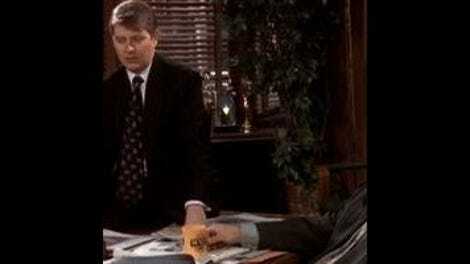 NewsRadio: "Halloween" and "Awards Show"
Bill's scene-capping line, tossed out after Joe appears unexpectedly turned out in a suave tux imitating James Bond, turns out to be the most quotable moment in an episode full of high-concept humor and a major guest star. It's the most apt illustration of the lesson this week's episodes have to teach us: Sometimes the hidden joke is more meaningful than the overt one. Sometimes what's written on the page needs to take a back seat to what appears unexpectedly on the stage. Granted, “Awards Show” does produce a line that still has plenty of use in it thirteen years later: “Go to hell, Costas.” But the big setups of the episode don't pay off as well as they might have. In the A story, the staff is convinced that they'll end up empty-handed at the American Broadcasting Society Awards like always, while Dave stews over a newspaper clipping in which a rival news director takes a swipe at twenty-nine-year-olds. Meanwhile B-story Matthew tries to eradicate the ants in the breakroom. Bob Costas ruins Matthew's plotline by overacting shamelessly as he tells a historic-baseball anecdote and sics the cops on him for revealing his welt-covered buttocks. The climax of the A-story, as Dave drowns his sorrows at winning all the ABSAs (“I swear, it's ABSA fever out there!” Jimmy James enthuses in mockery of Dave's insistence on using the acronym) and finds out that his nemesis Marty “The Party” Jackson was talking about himself in that newspaper story, similarly fails to produce a surprise with much humorous value. And the big running joke about Mr. James' Richard Nixon anecdote never comes to much. But even in a sub-par, network-cross-promotion-driven script, the ensemble is alert enough to exploit the serendipitous moments of inspiration that arise. One more case in point in addition to the Garelli line already mentioned: When Beth finds Matthew hidden in the break room cabinets searching for ants, he tells her he's doing it “to drammatize a point,” pronouncing the first A as in “wham bam thank you ma'am.” Beth, amused by the mispronunciation, prompts him to say it again, just so she can have one more private smile, and so we can, too. That's about one hundred times funnier than Costas talking about Frank “Home Run” Baker, the great dead-ball era hitter, and it didn't require selling the show's soul, either. Go to hell, Costas, indeed. I discussed the episodes backwards this week because “Your last name is Garelli?” is such a perfect epigram for this week's theme. So let's back up to “Halloween,” where the big jokes to which the episode builds (Dave in a dress, Bill hooking up with an old woman) take a back seat to Lisa's insecurities. 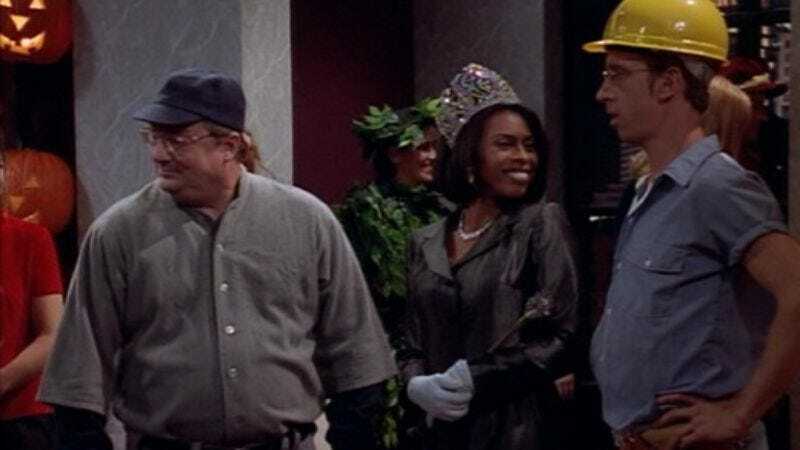 Now this is a situation where Lisa wanting to upstage Dave (“Are you going to let King Dork outdo you?” she shouts at the staff in a successful attempt to motivate them to dress up for the Mr James' Halloween party) is a major plot arc. But it's one that is far more difficult to dramatize and wring humor from than psychic-reveals-Bill-will-die-in-2032 or staff-refuses-to-get-into-Halloween-spirit. Yet the funniest moments of the episode coincide perfectly with the most low-key comedic set-ups: Lisa confessing to Mr. James not only that “costumes make me look chunky” but that she can't even wear a mask with what she's wearing right now because “I hate what I'm wearing right now.” When she berates Dave for looking better in her dress than she does, she tosses off “And your head looks just exactly the right size,” a reference to her earlier conviction that her head is too big. Not only does this bit of character-driven comedy play perfectly into Maura Tierney's strengths at playing twitchy and awkward, but it doesn't depend on sight gags and guest stars. And that's where we can find the heart of NewsRadio's genius, no matter what craziness competes for viewer attention in the show's more promo-friendly moments. - I don't mean to denigrate “Halloween,” which is a very good episode. For every bit that takes it down a peg (Dave-in-a-dress feels more like a knowing wink to Kids In The Hall fans than funny in its own right, high-heels dash into the office notwithstanding; the big reveal that Bill's “Dorothy” is a blond bombshell is just way overdone), there's a moment of sheer delight that redeems it (the staff clapping and chanting “dork! dork! dork!” as the elevator doors open and close; “Maestro, if you please—'Rumpshaker' or some reasonable facsimile thereof!”). - Hey, It's Still 1996 For A Few More Weeks! : “What is this, the Ellen Degeneres show?”, psychic infomercials. - I love Halloween parties on TV shows, because all the costumes seem to come straight off the rack at a well-stocked but predictable costume shop (unlike any Halloween party I've ever been to). Staff costumes: “alien autopsy coronor” (doctor), “lil' devil” (horns, red shirt and trident) “pretty ballerina,” “queen of England” (tiara and what Catherine was wearing before), “gay construction worker” (hard hat and rolled-up sleeves). Other costumes at Mr. James' party: angel, mummy, lobster, bumblebee, Davy Crockett, flapper, French maid, bear, Puritan, Greek girl, Elizabethan guy, Zorro, plant of some kind, swami, pirate. - It's unfortunate that we don't get to see Dave and Lisa doing Mr. James' “special spooky version of the hokey pokey” — we just hear the music while the cool kids sit on the sofa and laugh at them. - Dave goes from wearing a dress in Halloween to posing for the cover of Cigar Aficionado in these two eps. Last time I watched the X Games, they were calling that the Masculinity 720 (Goofy-Foot Version).